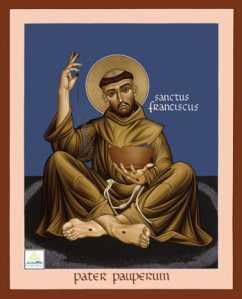 Francis is easy to diminish: he’s a bird-preaching saint, a wolf-taming saint, a saint in your backyard propped up in a bathtub shrine, Francis on the half-shell. He is the peace saint, the ecology saint, the troubadour, the juggler, the Brother Sun, Sister moon, Donavan-Zeffirelli romantic, twirling ‘round and ‘round in a golden plain turning blood red with wild poppies as the sun heats up in May. He’s a lovely man. And he was fierce and terrible in his loveliness, a medieval madman who wanted to be poor, poor as the wretched refuse that crowded every European town in the 13th century and filled the nostrils with the stench of that poverty. He wanted to share their lives. For him there was no middle way. It was who Christ was, it was where he would find him. It is said that Francis, at the end of his life, got his desire to be literally like Christ. After he had been engaged in an intense period of prayer, people reported seeing wounds in his hands and his feet. It is also said that every day after that until he begged to be laid naked on the cold stone floor of his cell to finish dying, he suffered the pain Jesus knew on the cross. I don’t know about that, and neither does anyone but Francis and God. Here’s what I do know. The fullness of Francis’ transformation into the Jesus he loved so much did not happen on Mount Alvernia when the mark of nails was seared into his flesh. If it happened at any one moment, it was two decades earlier. He had gone to Rome to find faith and forgiveness at all its shrines. He had found none. In fact the only place where anything like insight had come to him was when on impulse he paid a poor man to change clothes with him, and spent the day in the streets of the city begging with the beggars. It was not a serious moment. Play, really. But it shifted something. The leper stands in the middle of the road, perfectly still. One hand rests on the bell cord around his neck, the other hangs limply at his side. He is dressed in a filthy garment, patched together from bits of sacking and undyed wool, which hangs loosely upon his emaciated body. He regards Francesco and the horse steadily, his head slightly turned and his chin lifted, the better to see them, for his disease has eaten away half his of face and he has only one eye. Francesco does not speak, he cannot move. They face each other on the road, and the sun pours down over them, so that there are no shadows anywhere, nothing to soften or dim the reality of this encounter and nowhere to hide from the necessity of playing it out. The leper’s eye drills into Francesco; he can feel it penetrating into his brain. From childhood he has had a horror of lepers, and he has always avoided the lazaretto at the foot of Mount Subasio, where they sometimes congregate in the road, ringing their bells and calling out for alms. The stench rising from their rotting flesh, their phlegmy, guttural voices, pursue him in dreams, from which he wakes sweating and shouting for help. But this is no dream, and there is no point in shouting now, for no one will hear. He glances back down the road and into the neat ranks of olive trees. The world is uncommonly still. He could ride on. There is no reason to stop. As he passes, he can throw down his last coin to the leper. His horse lifts one hoof and paws the dirt. It is time to go on, to go home. 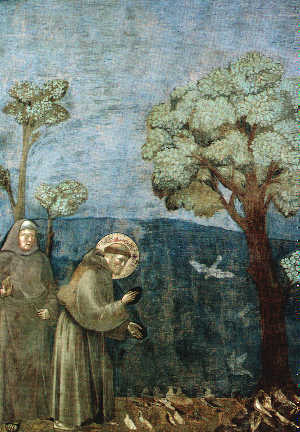 As Francesco drops his hand to the reins, his eyes fall upon his own expensive, well-fitting glove, and it dawns on him that this leper is not wearing gloves, which is odd; he and his kind are required to wear them when they leave their hospitals, just as they are required to wear and ring their bells to warn the unwary traveler of their approach. Again Francesco looks down upon the solitary figure of the leper, who has not moved a muscle. His hand is still wrapped around the cord of the bell, his head arrested at an angle. He is like a weatherbeaten statue, and Francesco has the sense the he has been standing there, in his path, forever. Something has been coming toward him, or he has been coming to something; he has known this for some time, and he has bent his energy in the direction of finding out what it might be. This was the reason for his pilgrimage to Roma. At the shrines he recited the requisite prayers, gazed upon relics, bones, bits of hair and cloth, vials of blood and tears, proffered the proper offerings, but he did not feel the burden of his sins lifted, and this spiritual restlessness drove him on. Only when he was with the beggars beneath the portico at the basilica did he feel some respite from this condition of urgent expectancy. He is in the grip of it again as he swings one leg over the saddle and drops to the ground beside his horse. The stillness of the world makes every sound acute: the clicking of the bridle chain as he leads the animal to a green patch nearby, the sound of grass tearing, and then the big jaws grinding as the horse chews the first clump. Francesco runs his hands through his hair, bats the dust from the front of his surcoat, and turns to face the man, who is there, waiting for him. The leper watches him with interest. His blasted face is bathed in sunlight; the black hole that was his eye has a steely sheen, and a few moist drops on his lips glitter like precious stones. He moves at last, releasing his bell cord and extending his hand slowly, palm up, before him. 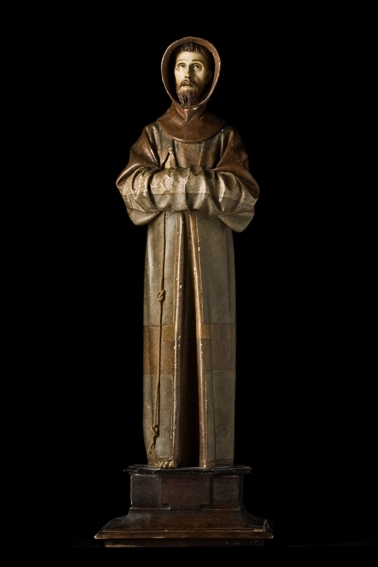 This supplicating gesture releases Francesco, for it dictates the countergesture, which he realizes he longs to make. Without hesitation, he strides across the distance separating him from his obligation, smiling all the while as if stepping out to greet an old and dear friend. He opens his purse, extracts the thin piece of silver inside it, and closes it up again. He is closer now than he has ever been to one of those unfortunate beings, and the old familiar reaction of disgust and nausea rises up, nearly choking him, but he battles it down. He can hear the rasp of the leper’s diseased, difficult breath, rattling and wet. The war between Francesco’s will and his reluctance overmasters him; he misses a step, recovers, then drops to one knee before the outstretched hand, which is hardly recognizable as a hand but is rather a lumpish, misshapen thing, the fingers so swollen and calloused that they are hardly differentiated, the flesh as hard as an animal’s rough paw. Carefully, Francesco places his coin in the open palm, where it glitters, hot and white. For a moment he tries to form some simple speech, some pleasantry that will restore him to the ordinary world, but even as he struggles, he understands that this world is gone from him now, that there is no turning back; it was only so much smoke, blinding and confusing him, but he has come through it somehow, he has found the source of it, and now, at last, he is standing in the fire. Tenderly he takes the leper’s hand, tenderly he brings it to his lips. At once his mouth is flooded with an unearthly sweetness, which pours over his tongue, sweet and hot, burning his throat and bringing sudden tears to his eyes. These tears moisten the corrupted hand he presses to his mouth. 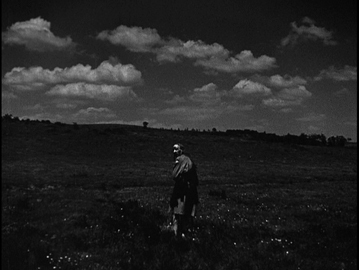 His ears are filled with the sound of wind, and he can feel the wind chilling his face, a cold, harsh wind blowing toward him from the future, blowing away everything that has come before this moment, which he has longed for and dreaded, as if he thought he might not live through it. He reaches up, clinging to the leper’s tunic, for the wind is so strong, so cold, he fears he cannot stand against it. Behind him, the horse lifts his head from his grazing and lets out a long, impatient whinny, but Francesco does not hear him. 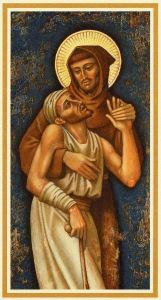 He is there in the road, rising to his feet, and the leper assists him, holding him by the shoulders. Then the two men clutch each other, their faces pressed close together, their arms entwined. The sun beats down, the air is hot and still, yet they appear to be caught in a whirlwind. Their clothes whip about, their hair stands on end; they hold on to each other for dear life. I just finished the book and, feeling emotionally drained and spiritually enlivened, wanted to read this powerful conversion scene again, with your introduction. It is just right, as is the book. That she takes us from our modern, shallow veneration of Francis, which barely resembles the worship he came to inspire in his lifetime, to the original scandal of his conversion, feels just right. May it help me to remember the scandal of the Christ I try to follow. Was not expecting to hear from you (but so glad to hear the WOW)! Had just come back to say the obvious: that it all points us to the scandal of the incarnation. What scandalous love is this. Praise be. Really, when it comes down to it, the Incarnation is why I am a Christian… Yep… Scandalous, that’s the only word for it.